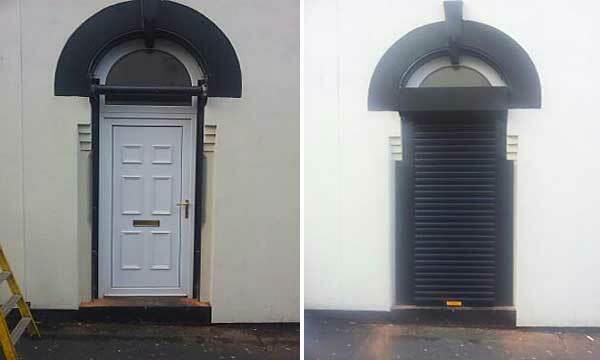 We were approached by an opticians in West Bromwich whom had recently experienced an unsuccessful attempted break in and wanted to make the premises more secure without taking away the aesthetics of the recently refurbished building. The opening had an arched vision panel above with very little tolerance for clearance and obviously the existing door aperture required full width access. We manufactured a very bespoke and individual single doorway roller shutter door that had additional covering plates to disguise the rendered aperture voids and provide additional strength to the door, whilst not altering the doorway aperture and providing the opticians with great security and a pleasing appearance. A custom single roller shutter that adds security to the premises whilst retaining good aesthetics.